Imagine your organization has decided to completely overhaul one of its integral business processes, like underwriting an insurance product or reconfiguring your mailroom. To make sure the business process improvement (BPI) effort is successful, you want to bring in a consultant to help with the initiative. However, after doing some initial research, your team is concerned about how much you might need to invest to get the expertise you need. Never fear: here are five tips on how to find a consultant your company can afford, on almost any budget. Men and women working with papers and communicating. 1. Determine the specifics of the engagement. By clearly determining what needs to be done, your organization will help avoid scope creep. Scope creep often occurs when there are unclear requirements or there is a lack of planning before the initiative begins. Basically, when scope creep happens, the engagement begins to go outside the initial boundaries set forth in the contract. At that point, an initiative often incurs additional costs since additional work is required, especially if there is no clear limit to what should and shouldn’t be included. The more detailed information you can give a consultant about the process you want to improve, and the more clearly you can articulate exactly what you’re looking for, the more accurate quote they’ll be able to give, and the more easily you’ll both be able to manage the engagement. It will also help give you a range of what you can expect to invest financially in the consulting engagement. 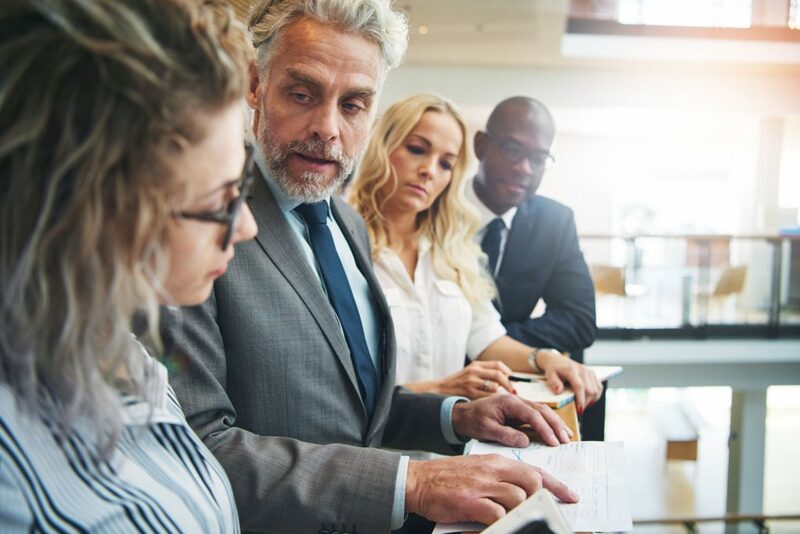 If your organization is having trouble determining what the scope of a particular project needs to be, it’s possible to bring in a management consultant to help determine the scope of an engagement. While doing this is an initial investment, the upfront planning will undoubtedly save time, money, and frustrations later. 2. Proactively communicate your budget. Once you have clearly determined the scope of the engagement, your team needs to decide on the budget. Even if your scope is somewhat unclear, it’s much easier for a management consultant to stay within budget if they know what your budget is before providing a quote or proposal. So, be sure to clearly communicate to them what money you have allocated for the project, and what your upper limit is. By knowing your budget for the initiative, consultants can be transparent with you about what $10,000, $50,000, or $2 million could accomplish, and everyone will be on the same page going into the engagement. You’ll also be able to compare quotes more easily and see what scope of services you’d receive for the budget you have. 3. Look for consultants who utilize local talent. One of the best ways you can reduce the expense in almost any consulting engagement is to work with a company who utilizes local talent. By working with local talent, your organization will significantly reduce its expenses since the firm won’t be billing as much for travel time or mileage, nor will they be passing the cost of their flights, hotel stays, and dining onto you. If your initiative is a particularly large one that requires lots of in-person contact time, this will be especially crucial. There are many consulting firms who will bring in consultants from across the country or offshore, even if they have a local office. It’s important not just to work with a consultant that has a local presence, but to know that the specific people with whom you will be working are based in your local area. Most local consulting firms do not use the multi-layer management structure found in the major national/international consulting firms. This results in a rate differential of $650 per hour type rates for senior consultants flown in from out of state versus local senior consultants with rates between $150-$250 per hour with comparable or better expertise and experience. This also supports our local economy as salaries and taxes stay local compared to those dollars going out of state. These are just a couple reasons to buy local. 4. Interview multiple consultants and compare quotes. Like you would with any other product or service, it’s important to do research and compare the quotes your organization receives from consultants. There are several questions we recommend you ask possible consultants as part of your research, including what their services cost and what expertise they have. Knowing the answers to these questions will help your company determine which consultant is most qualified and whether any price differences are justified because you’d be receiving a more robust scope, more thorough approach, or access to a more experienced consulting team. However, be sure not to give your company too many options from which to choose. Research shows that when people have six options, they are more likely to make a purchase than when they have 24. So, give your team enough options to make a well-informed decision, but not so many that your organization is overwhelmed about moving forward. Personally, we recommend obtaining five to seven quotes initially, then following up with the top three candidates before making a final decision. Keeping your options narrow will help prevent your team from experiencing “decision fatigue,” which will empower you to make a better, more well-rounded decision rather than giving one criterion, like price, too much importance. 5. Partner with consultants who can blend with your team. As you’re interviewing potential consultants, be sure to ask if they have experience working as part of combined client-consultant teams. One simple way to reduce expense is to have a consultant make the initial recommendations for the initiative and then to oversee its implementation while your in-house staff takes responsibility of implementing the new process, initiative, or project. Because this approach will limit the consultant’s involvement to only the most key elements, your organization will have more control while still benefiting from guidance from a consultant but at a significantly reduced cost. Another reason we recommend this approach when possible, aside from reducing your company’s investment for the consulting engagement, is that it will help you gain consensus among your staff, and it will make the people change management process easier since your team will be more involved in the initiative. Want to learn more about how to find an ideal consultant for your company’s project? Contact us or read our blog for other great tips!